Ukraine's president has ordered the withdrawal of all state services, including funding for hospitals and schools, from rebel-held areas. Petro Poroshenko issued a decree that also asks parliament to revoke a law granting self-rule to the Donetsk and Luhansk regions. Pro-Russian separatists held elections there last month which Mr Poroshenko condemned as illegal. More than 4,000 people have died in the conflict in eastern Ukraine. Separatists have been fighting government forces since April in a war that has driven hundreds of thousands of people from their homes. Mr Poroshenko's ruling says all state companies and institutions should end their work in the Donetsk and Luhansk regions within a week. It also says Ukraine's central bank is to close down all banking services - including card operations - in some areas within a month. The decree calls for parliament to cancel the "special status" law granted under a ceasefire in September. It comes as Vladimir Putin was rebuked by Western leaders at the G20 summit in Australia over Russia's role in Ukraine. 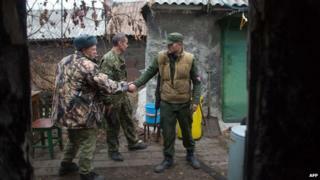 Ukraine and the West have accused Russia of backing the separatists with soldiers and heavy weapons. The Kremlin denies doing so. The self-proclaimed people's republics of Donetsk and Luhansk held elections on 2 November that were denounced as illegal and in violation of the September truce by both Mr Poroshenko and the EU. The rebels said Alexander Zakharchenko had been elected regional head in Donetsk, while Igor Plotnisky secured a victory in Luhansk. Ukraine's government indicated earlier this month that it would freeze budget subsidies for areas not under its control.